This article originally appeared in Tradition 11, 3 (1970), pp. 5-12. Quite a few years ago I read a slim little volume, entitled Education in a World Adrift, of which,—unfortunately—I remember only the title. 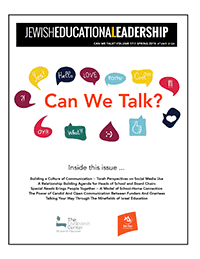 Pondering over the subject of Jewish education, I realized that its most important aspect is the insight that in these days Jewish education has to be conducted in the midst of a world which has lost its anchor and is drifting dangerously. For many years now we have been wont to talk of the crisis of Jewish education in modern Jewries. But this crisis was occuring within the confines of a world at large that was relatively secure, well-ordered, and steady in its course. There was the goddess of progress in whom everyone believed unquestioningly, and there were also some “kooks” who were making a nuisance of themselves by talking about a crisis in Jewish education—a matter which in any case was of such minor significance that it did not deserve the attention of the men of affairs, who were glorying in their importance in the world of progress and mundane success. All this was a long time ago—or so it would seem to us. Today, the picture has changed radically. The crisis of Jewish education is a problem to contend with in the midst of the all-embracing crisis of a world adrift. We cannot appreciate the problem of Jewish education without recalling some of the main features of the world-wide crisis that confronts mankind. If we look at the world at large, what we behold is a sick civilization, a civilization in the process of disintegration and dissolution. What are these features? Most prominent among them is the collapse of the value system by which this civilization was functioning in the past or—at least—was able to pretend to have been functioning. In the area of ethics and morality there is confusion as to the basic principles. What is right, what wrong? What is good, what evil? All our value concepts are being questioned today. The modern, scientific world has been affirming far too long that there are neither Absolutes nor absolute values. All our value concepts are relative. But relative to what? To people, to society. Fine! But which people, which society? American-Russian, Capitalist,Communist, White-Black, Jew-Gentile? It is enough to raise the question in order to realize how such relativism leads to confusion, conflict, and chaos. Having rejected the idea of any absolute value principle, modern philosophers maintained that man himself must become the creator of his values. Not unlike the old-fashioned God of the Bible—of whom they had emancipated themselves—who created the world ex nihilo, modern man has now to create himself and his values out of nothing. However, they forgot to say, which man. Man as such, man in the abstract does not exist. Man is always a certain type of man, living at a certain time, in a certain place, man of a certain background, with definite time-place-background-conditioned interest. And there are all kinds of man. So which man is to be the creator of his values? Everyone of them for himself, of course. The result is: everyone doing his own thing, being convinced that it is the right, the good, the beautiful. When, because of the fortunes of the war, the last phase of the “Final Solution” of the Jewish problem intended by the Nazis was reached, Heinrich Himmler had the following to say to the assembled ss. leadership: “To have gone through that (i.e., the extermination of six million Jews) and to have remained an honest man just the same, save for the exceptions due to humannature, that is what has made you tough and strong. This is a glorious page in history, never before, never again to be written.” The statement is not inhuman, nor even absurd. Within the frame of reference of modern civilization it is logical and has its validity. In a world in which there are no “Thou-shalts” and no “Thou-shalt-nots” that cannot be questioned, in which man is the creator of his values ex nihilo, where all principles of morality are relative to the man and the society that creates them, it does make good sense to commit genocide and yet to consider oneselves honest people. It is the ultimate logic of a relativistic ethics to which modern man has dedicated himself. One may also see in it the ultimate manifestation of the collapse of the value system of modern civilization. In the area of education this collapse of the value system has had its most fateful consequence in what became known as the principle of permissiveness. The slogan was: “To every child a childhood.” Fine! But every child also has the right to learn how to distinguish between good and evil, between right and wrong, excellence and mediocrity, cheating and honesty. If the child is not taught the difference, it assumes that it makes no difference, that the educators themselves—parents and teachers—do not care about the difference, and—finally—that they do not care about the youth entrusted to their care. Permissiveness indeed means that they do not care. They do not care enough because the system of values has collapsed for them too. It is rather pathetic to see how in these days youth carries on its rebellion under the slogan of doing one’s own thing. What do they think their elders have been doing? What is General Motors doing? What the military-industrial complex? What are corrupt politicians doing, what are lobbyists, the Mafia, cheating husbands or wives? What is Russia doing in the Middle East, or the U.S.A. in Vietnam? They are all doing their own thing. That is the reason why we are at the brink of the abyss today. What matters in this world is not the thing that a man does, but the standard of values by which he does what he does. Permissiveness has been the great betrayal that the elder generation perpetrated on its children. It has been modern civilization’s abdication of responsibility toward the future. Of course, one cannot help being permissive in the education of one’s children, if one practices permissiveness in self-education, if one is permissive toward oneself in one’s own life style and ethical and moral conduct. In a condition of the disintegration of all value standards betrayal of the future by permissiveness is unavoidable. However, it would seem to us that the root of the trouble goes much deeper. There has been in modern civilization a gradual loss of the meaningfulness of existence; not only of its individual aspect, but of existence in its universal totality. A world anchored in the will of a Creator has a spiritual quality to it, it has meaningfulness. Martin Buber, discussing the idea of revelation, maintains that one of the things that happens to a person who encounters God, who meets the Divine in life or history, is that he comes out of the experience with a sense of meaningfulness. He may not be able to articulate the meaning in words clearly and distinctly; but he has gained the overwhelming conviction that from now on nothing can be meaningless. He learns that reality is meaningfulness. He knows that what he has to do is to go out into life to discover it. It is this sense of meaningfulness that modern man has lost. Science has transformed the universe into a chance event—arising from nothingness—coming from nowhere, going nowhere, propelled on by laws of nature that function because they function, without a purpose and without inherent meaning. There is no plan and no goal. What is because it is. No wonder we have ended up talking of the absurdity of existence. The consequences of this loss of the sense of meaningfulness is twofold. What is the value of man himself in a universe in which the All itself is a mere chance event? What the significance of one infinitesimally small chance event among billions of other chance events! These days we hear on all sides complaints about the depersonalization of life, its dehumanization. The individual is a mere number, a statistical datum. This, however, is not due to a vast impersonal bureaucracy, as it is often assumed. The malaise is metaphysical. Man as chance event in the universal ocean of chance events is indeed not a person. For a person is an entity of the spirit and the spirit is meaningfulness. In a world which has been completely materialized, caught in a mathematical formula, man has lost his existential dignity. The loss of meaningfulness to existence is also responsible for one other pervasive feature of this civilization, i.e., boredom. In a state of the collapse of the value system, one action is like any other; because of the loss of meaningfulness nothing can be taken too seriously. There is a general lack of direction, lack of goals. There is no basis for genuine commitment, to one distinctive course of action rather than to another. No previous generation of man had so much leisure time as ours; no other generation had so little knowledge of what to do with it as ours. No other generation of man has been as desperate about killing time as ours. Time is hanging heavy like lead on the soul of man today. Is there any wonder that ours is becoming a drug culture? Youth that senses the dissolution more than their elders tries to escape boredom, emptiness, meaninglessness. They, more than any other segment of the population, are asking the question about the aim, the meaning, the value, the direction of it all. We have to face the problems of Jewish education in the midst of a civilization in the process of disintegration. In a sense this may be our opportunity. In former times Jewish education had an authentic competitor—another educational system, the high school, the university, a strong, self-assured civilization that was not Jewish and that exerted a tremendous influence on our lives. It shaped and formed the Jew more than did Judaism. It was education par excellence. Beside it, Jewish education was indeed a pale and sickly plant, a not terribly attractive adjunct, something marginal and secondary to it. Today the situation has changed fundamentally. The competitor is no longer an authentic one; the competitor is dissolution itself, the disintegration of value standards that threatens to engulf our homes, our families; the competitor is emptiness, the loss of vision, the loss of faith, the loss of trust. Are we going to leave the major education of our children to a general educational system which is itself overwhelmed by a chaos of the spirit and a moral helplessness in the face of the challenge of disintegration?! Recently a national conference of public school educators took place in Chicago. According to newspaper reports, one of the educators suggested that the entire public school system be shut down for ten years, for, he reasoned, it would take that long to figure out how to run the schools to the benefit of the students. He also called all current educational innovation a “fraud” and asserted that students would miss nothing if the entire school system were shut down. There was only one voice raised against the suggestion. The only argument that, apparently, could be mustered against the suggestion was that the idea was “unreasonable because those in control aren’t going to let it happen.” The educators seem to have overlooked the fact that every school system is a reflection of the civilization in the midst of which it finds itself. If all the innovations in a school system are a “fraud” then there is fraud at the very core of the society responsible for it. Before the school system may be changed, society itself would have to be reformed. The problem is not one of curriculae, but of the essence of civilization itself. I do not say, scrap the schools, the colleges. They can provide our children with information; they can teach them necessary skills in physics, chemistry, languages. But the teaching of skills is not education. Education’s concern is with the character, the personality, the soul of the child and youth. Are we going to entrust the responsibility of education to a school system against whose closing down for ten years the only argument that could be offered was that “those in control aren’t going to let it happen”? Are we going to entrust our children to a civilization that is floundering without direction and without a trustworthy vision of tomorrow? I do not know what other segments of the general community are going to do, attempting to cope with the sickness of the times. One thing I do know: we have to turn inward, on our resources of the soul and the spirit. We cannot stem the tide of disintegration with borrowed strength and borrowed values. Strength, borrowed, is weakness; values, borrowed, are worthless. As Jews we have to do something we should have done a long time ago: we should give Judaism a genuine chance to guide us and to shape our lives. Jewish education must no longer remain a marginal affair, it must move to the center of our educational responsibility toward our children. It has to fill the vacuum of values and meaning; it has to provide guidance in a time of confusion; it has to teach a way in the midst of chaos. As far as our children are concerned, Jewish education has to provide for them the vision of the future, without which youth cannot prosper and mature; moreover it has to be done at a juncture in history when the youth of the world is afraid to look beyond the passing moment and seeks its salvation in the deceptive enjoyment of a futureless Now. In this hour of a sick civilization, Jewish education can no longer be a mere adjunct to a general education which has betrayed the youth of the world. It has the responsibility to lead our youth to the sources of faith, trust, and hope; faith in life itself, trust in the meaningfulness of existence, and hope for man on this earth. If Judaism will not do it for Jews, there is nothing else left in the world to do it for them. The question is no longer, how to preserve our Jewish heritage, but how to preserve life itself in dignity and meaningfulness. We are charged by destiny with an awesome responsibility. We need homes that in all seriousness are willing to give Judaism a chance; personal conduct on the part of parents and teachers that exemplifies the realization of Jewish values in dignity; a community at large that manages its own affairs guided by ethical principles that are drawn from the spiritual resources of Judaism. We need time for Jewish education. We need a teaching profession that enjoys the first claim on the respect of the community and deserves it. We need a Jewish community in which those very values that we undertake to communicate to our children are alive, practiced and respected. But most of all we need the understanding and the enthusiastic acknowledgment that Jewish education has to have first priority among all our local responsibilities. Indeed, it is no longer a matter of preserving Judaism, but of preserving life by the only means at our disposal.